Crocodiles (Image 1.) are regarded both as Until 1970s, the main catch in the Caspian Sea was sturgeons and bony fish species. Species of Serranidae, Scombridae, Clupeidae, Haemulidae, Sciaenidae and Sparidae families were traditionally caught in the Persian Gulf and the Oman Sea. Shrimps were also valuable productions for fishermen in the Persian Gulf. However, aquaculture production was very negligible in Iran. Furthermore, Iranian Fisheries Research Institute (IFRI) in Bandar Anzali in Gilan province (in the Caspian Sea coast) was the only fisheries research center in Iran. This institute started to carry out fisheries works in rivers in the spawning season for artificial propagation of some important commercial fish species of the Caspian Sea, such as kutum and Caspian salmon migrated to rivers. In 1973, a cooperative complex was established with the expert from USSR for artificial propagation and fingerling culture of sturgeon in Gilan province. In 1988, after Iran - Iraq war, the Iranian government gave attentions for fisheries, aquaculture and fisheries industries. In those years, the stocks of the Caspian Sea anadromus bony fish species decreased dramatically. The reasons were over fishing, loss of natural spawning ground due to environmental pollution, use of water for agricultural purposes and illegal fish fishing (Ghaninejad et al., 2001; Ghaninejad and Abdalmalaki, 2009; Valipour and Khanipour, 2009). Consequently, few complexes for artificial propagation, fry and fingerling culture were established, and restocking of commercially important fish species were carried out into the rivers of the Iranian coast of the Caspian Sea. The main aim of this review is to describe the present status of fisheries in Iran. The information described below was mainly provided by Iranian Fisheries Organization Anonymous (1998-2009). The Caspian Sea, the largest lake in the world, is located in the northern Iran. The Caspian Coast including the three littoral provinces of Gilân (center Rasht), Golestân (center Gorgân) and Mâzanderân (center Sâri), with its thick forests and intensive rice cultivation presents a striking contrast to the dry inner plateau of Iran. The most important commercial bony fish of the Caspian Sea are kutum (Rutilus frisii kutum), golden grey mullet (Liza aurata), leaping grey mullet (Liza saliens), pikeperch (Sander lucioperca), European carp (Cyprinus carpio), roach (Rutilus rutilus), Caspian shads (species of genus Aloza), bream (Abramis brama), Caspian shamaya (Chalchalburnus chalcoides) and Caspian vimba (Vimba vimba). The average of annual catch of the bony fishes between 1997 and 2008 was 17702 ±3488 mt. The annual harvest of bony fishes increased 51.9% from 1997 to 2008. Three species of kilka fishes lives in Caspian Sea: anchovy kilka (Clupeonella engrauliformis), big eyed kilka (Clupeonella grimi) and common kilka (Clupeonella cultriventris). The annual mean catch of these fish between 1997 and 2008 were 45169 ±29135 mt. The maximum catch was in 2000 (95000 mt) and its minimum was oc-curred in 2008 (15411 mt). There was a reduction (83.8%) in the catch of kilka fishes from 1997 to 2008. The Caspian Sea is inhabitant of five species of Sturgeon fish: great sturgeon (Huso huso), Russian sturgeon (Acipenser guldenstadedti), Persian sturgeon (Acipenser persicus), stellate sturgeon (Acipenser stellatus) and spiny sturgeon (Acipenser nudiventris). Annual average catches of these fish and caviar production between 1997 and 2008 was 796 ±433 mt. After 1990, har-vesting of sturgeon fish and caviar production were declined sharply (86%). For example, the range of catch of sturgeon fish was changed be-tween 1600mt in 1997 to 225 mt in 2008. Table 1 shows the amount of fish catch in the Caspian Sea between 1997 and 2008 (Anonymous, 1998-2009). The Southern Seas include the Persian Gulf, the Oman Sea and the Indian Ocean. The most important commercial fishes are: skipjack tuna (Kasuwonus pelamis), long tail tuna (Tunnus taggul), yellow fin tuna (Thunnus albacores), kawakawa (Euthynus affinis), narrow-barred Spanish mackerel (Scomberomorus commerson), chub mackerel (Scomber guttatus), sharks (Cacharhinidae), scads (Carangidae), black mar-lin (Makaira indica), sailfish (Istiophorus platyp-terus), snappers (species of genus Lutjanus), southern meagre (Argyrosomus hololepidotus), orange-spotted grouper (Epinephelus coioides), deep-flounder (Pseudorhombus elevates), black-pomfert (Parastromaleus niger), barracudas (Sphyraenidae), black banded kingfish (Seriolina nigrofasciata, Carangidae), common dolphinfish (Coryphaena hippurus), and species of genus Sardinella. The annual average catch of fishes was 279317 ±45440 mt and its range was 220726 mt (in 1999) to 368496 mt (in 2007). After 1997, the catch of fishes in the Southern Seas 26.3% increased. In addition to these species, the Per-sian Gulf is the main source of shrimps. Three species are found in this area. These are Indian white shrimp (Penaeus indicus), banana shrimp (P. merguinsis) and green tiger shrimp (P. semi-sulcatus). Annual mean shrimp catch after 1997 was 6826 ±1520 mt, the maximum catch oc-curred in 2006 (9128 mt) and its minimum was 4570 mt in 2000. Table 2 shows the amount of fish and shrimp catch in the Southern Seas be-tween 1997 and 2008. Chinese Carps constitutes 80% of fish pro-duction obtained from freshwaters. Southern barbs (Barbus grypus, B.shapeyi and B.xanthopeterus), pikeperch, bream, kharamolia (Capoeta capoeta) and cat fish (Silurus glanis) are other important species harvested from freshwaters. In Iran, minimum amount of fish harvest occurred in 2003 with 13010 mt and its maximum was in 1999 (38763 mt). Its annual av-erage was 27465 ±8254 mt. Chinese carps, rainbow trout, sea and fresh-water shrimp are cultured in Iran. The first two are the most commonly cultured fish (Table 3). The ratio of aquaculture production to total fish production was 7.5% in 1997, 12% in 2002 and 28.2% in 2008. Table 3. Amount (X1000mt) of aquaculture production and fish harvest from fresh waters in Iran between 1997 and 2008. Chinese carps: they are silver carp (Hy-pophthalmichthys molitrix), big head carp (H. nobilis), grass carp (Ctenopharyngodon idella) and common carp (Cyprinus carpio). After 1997, the annual average production of these fishes was 49203 ±25491 mt, its range varied between 23000 (in 2000) and 97262 (in 2008) (Table 3). Therefore, the culture of Chinese carps increased 3.5 times. Rainbow Trout: among cold water fish rain-bow trout (Oncorhynchus mykiss) is cultured in race-ways in Iran. The annual average production of O. mykiss is 20545 ±18445 mt. In recent years, the production of this fish has increased sharply. For example, the production of O. mykiss in-creased to 58761 mt in 2008 from 1900 mt in 1997 (31 times more). Shrimp: Indian White shrimp was the most popular in shrimp culture in earthen ponds in Iran, but after 2005 Whit Leg Shrimp (Li-topenaeus vannimei) has become the most im-portant species for shrimp farms by cooperation with Vietnam’s experts. Maximum production was 8903 mt in 2005 and its minimum was 163 mt in 1997. Annual mean of shrimp production after 1997 was 4092 ±3010 mt. Freshwater shrimp: Aquaculture of giant shrimp (Macrobrachium rosenbergii) was started in 2002 with 6 mt production. However, in 2008 it exceeded to 257 mt (42.8 times more). Annual average production after 1997 is 127 ±129.7 mt. There has been an increase in the fish pro-duction in Iran after 1997 (Figure 1). The total production of fish and shellfish was just over 562000 mt in 2008. However, it was approxi-mately 400000 mt in 1997. In Iran, total fisheries production was the lowest (399080 mt) in 2002. It reached the peak value in 2007 with 575560 mt. 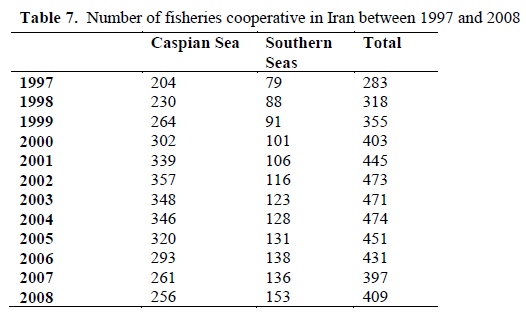 Fish harvest carried out in the Southern Seas is the most important component of fisheries pro-duction in Iran (Table 4). Fisheries production in the Southern Seas in 1999 was 226500 mt. It ex-ceed to 374447 mt in 2007. The maximum fish catch in the Caspian Sea occurred in 2000 (110000 mt), but it reduced to 39174 mt in 2008 (64.4% decreasing). The mean annual catch from the Caspian Sea after 1997 was 63666 ± 27723 mt. There have been fluctuations in the fish har-vest obtained from freshwaters in Iran. It was 35000 mt in 1997, 25500 mt in 2001, 13000 mt in 2003. However, there has been an increase in the fish harvest obtained from freshwaters after 2003. It was 18500 mt in 2004, 20200 mt in 2005, 22200 mt in 2006, 25000 mt in 2007 and 34900 mt in 2008. Although the contribution of aquaculture production to total fishery production is relatively small there has been a steady in-crease in the aquaculture production of Iran. For example, aquaculture production was only 30000 mt in 1997, but it reached to 158.6 mt in 2008. Fry and fingerlings of kutum, sturgeons, Cas-pian salmon, bream, pikeperch and roach have been produced for restocking purposes into the Caspian Sea resources. On the other hand, about 1% of Sturgeon fry are used for aquaculture pur-pose. Fry of Southern barbs are introduced to southern rivers and lagoons. 10-15% of shrimp post larva production and total of yellow-fin sea bream fry production are used for restocking into Persian Gulf. After 1997, the annual mean of kutum fry production was 182.731 ±42.699 million. It was 142.092 million in 1997. In 2008, it exceeded to 262.458 million (1.85 times more). The range of sturgeon fingerlings production was between 9.943 million (in 2006) and 24.557 million in (1999). Its annual mean was 17.742 ±4.458 mil-lion. The annual mean number of salmon pro-duction between 1997 and 2008 was 0.409 ±0.089 million and its range was between 0.306 and 0.611 million. Artificial propagation and fry culture of Cas-pian roach were started in 1998. The annual mean of fry production was 11.146 ± 5.262 million. The range was between 3.315 million and 19.120 million. On the other hand, artificial breeding and fry culture of Southern barbs were begun in 2000 with 0.3 million and it reached to 5.132 million (17.1 times more) in 2008. They were introduced into Karoon, Karkheh and Dez Rivers in Khozestan province and into some lagoons lo-cated in this province for restocking purposes. The artificial spawning and fry culture studies of yellow fin sea bream were started in 2005 with 0.05 million fry, one year later the production ex-ceeded to 0.650 million. Its yearly average was 0.215 ±0.291 million. In addition, the artificial propagation and fry culture of the Persian Gulf fish species especially orange-spotted grouper (Epinephelus coioides) started in 2006 with 0.05 million fry. The production was 3.716 million in 2007 and 0.586 million in 2008, respectively. In 2005, 20000 black-lipped pearl oyster (Pinctada margaritifera) larvas were produced in Iran. The production of shrimp post larva in 1997 was 24.7 million. In 2005, it exceeded to 1142.7 million. 10-15% of post larva productions were released to the Persian Gulf for restocking. 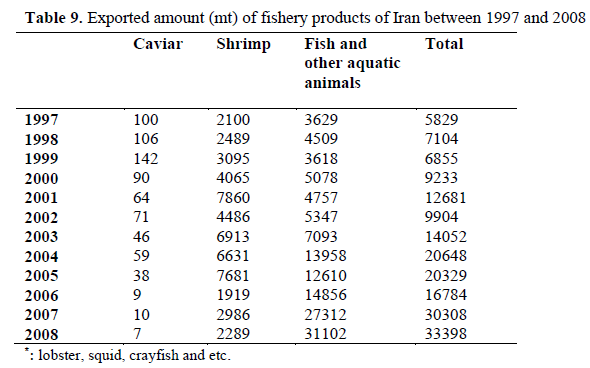 Table 5 shows the production of fish fry and fingerlings, and shrimp post larva in Iran. In Iran, fish consumption of per person was 4.5 kg in 1997. Although fish consumption is in-creasing from year to year, Iran is still behind the world average in fish consumption. Iranian peo-ple eat 7.35 kg of fish per capita per year. Figure 2 shows the fish consumption of per person per year in Iran between 1997 and 2008.
in the Southern Seas was between 86904 and 133494. Its annual mean was 110989 ±18178 people. Similarly, the Southern Seas fishery had more vessels than those of the Caspian Sea. For example, there were more than 10000 vessels in the Southern Seas fishery, but that of the Caspian Sea was just over 1000 (Table 6). The number of employed fisherman in aquaculture sector and in freshwater fishery, in the Caspian Sea, in the Per-sian Gulf, Oman Sea and Indian Ocean, and the number of vessels in different years in Iran are given in Table 6. In 1997, 108398 people were employed in Iranian fishery in total. This number was just above 170000 in 2008 (Table 6). The number of employed fisherman in aquaculture sector and in freshwater fishery in 1997 and 2008 was 10250 and 28073 respectively. In the Caspian Sea, the number of fisherman in 1997 was 9864. In 2002, it reached maximum (15015). However, rela-tively more people have been employed in fish-ery in the Southern Seas. The range of fisherman in the Southern Seas was between 86904 and 133494. Its annual mean was 110989 ±18178 people. Similarly, the Southern Seas fishery had more vessels than those of the Caspian Sea. For example, there were more than 10000 vessels in the Southern Seas fishery, but that of the Caspian Sea was just over 1000 (Table 6). The number of employed fisherman in aquaculture sector and in freshwater fishery, in the Caspian Sea, in the Per-sian Gulf, Oman Sea and Indian Ocean, and the number of vessels in different years in Iran are given in Table 6. In recent years, there has been an increase in the number of fisherman cooperatives in Iran. The number of fisherman cooperatives in the Southern Seas fishery was 79 in 1997. This num-ber increased to 153 in 2008. Those of the Cas-pian Sea were 204 and 256 respectively (Table 7). Fisheries investment in Iran in 2000 was 71.2 million $. In 2008, it raised to 446.8 million $ (6.3 times more). The minimum investment oc-curred in 2003 (68.6 million $). The most im-portant export fishery products are caviar, shrimp, fish species and other aquatic animals. The range of exported caviar value from Iran af-ter 1997 was between 13.327 and 44 million $, its annual mean was 30.302 ±10.990 million $. Shrimp was the second important fisheries prod-uct for export. It reached the maximum level in 2005 with 32.844 million $. The value of fish and other aquatic animals (lobster, squid, crayfish and etc.) exported in 1999 was 4.394 million $. In 2008 it exceeded to 37.613 million $. The range of total value of export fishery products was be-tween 38.983 million $ (in 2006) and 87.432 mil-lion $ (in 2004) (Table 8). 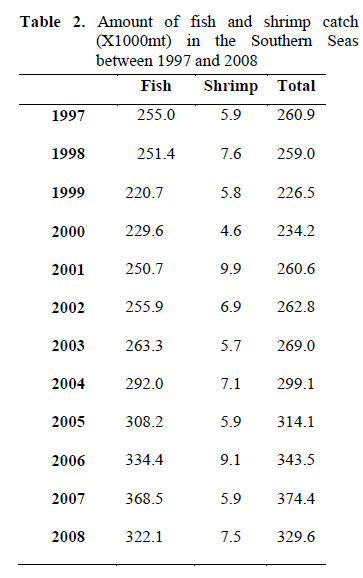 Total amount of fishery product export was 5829 mt in 1997. It reached to 33398 mt (5.73 times more) in 2008 (Table 9). There has been a sharp reduction in the export amount of caviar in recent years. In 2008, the amount of caviar export was at minimum level with 6.6 mt. On the other hand, it was 142 mt in 1999. After 1997, the range of shrimp export was between 1919 and 7860 mt, with mean 4376 ±2264 mt. The number of can factories in 1997 was only 47. In 2008 it exceeded to 134. The number of fish powder and fish meal factories was 26 in 1997. It reached 47 in 2003. The number of re-frigerator units in fishery was 65 in 1997, 133 in 2005. The number of frozen units was 53 in 1997. It increased to 125 in 2008) (Table 10). In 1997, the capacity of can factories was 203 mil-lion cans. In 2008 it exceeded to 569 million cans (2.8 times more). Production of fish powder and fish meal in 1997 and 2003 was 600 and 1230 mt/daily material respectively. The minimum ca-pacity of refrigerator units was in 1999 with 79000 mt and its minimum was in 2004 with 105000 mt. The capacity of frozen units in 1998 was 769 mt/daily. It increased to 2038 mt/daily in 2008 (Table 10). In the Caspian Sea bony fishes species, stur-geons and kilka are caught with beach sine with-out bag, fixed gill-net and longer net, respec-tively. However, fixed gill-nets were also used illegally for catching bony fish species in Iranian coastal waters. In the Southern Seas, in Shrimp catch are carried out by bottom trawl and pelagic fish species are caught by pure sine, drift net and long-line. Benthic fish species are caught by drift gill-net and pots. In addition, Sardinella are caught by beach sine with bag. Kutum is the most important commercial bony fishes in the Iranian coastal waters of the Caspian Sea. Between 1997 and 2008, it con-tained 52.6% of the catch composition of bony fish species. Emadi (1992) reported that kutum comprised 70% of caught bony fish. As regarding last 50 years, the minimum and maximum catch-es of kutum were occurred in 1981 with 97.6 mt and in 2007 with more than 14000 mt, respective-ly (Ghaninejad and Abdolmalaki, 2009; Valipour and Khanipour, 2009). The introduction of kutum fry into Caspian Sea caused a remarkable in-crease in kutum catch (Ghaninejad et al., 2001). Grey mullets are exotic species for Caspian Sea. Between 1930 and 1934, 3 million of golden grey mullet and leaping gray mullet were intro-duced from the Black Sea to the Caspian Sea by USSR experts (Belyova et al., 1989). In 1984, grey mullets appeared in the catch composition with 56.8 mt in Iranian waters of Caspian Sea. The maximum catch occurred in 1984 with 6957 mt. In the past, golden gray mullet comprised 70% of the total gray mullet catch, but in recent years it exceeded to 98% (Ghaninejad and Abdolmalaki, 2009). After 1997, gray mullets contained 24.8%.of the bony fish catch composi-tion. Between 1982 and 1991, grey mullets con-stituted 25% of the bony fishes in Iranian coastal waters of Caspian Sea (Emadi, 1992). The Euro-pean common carp enclosed 9.1% of the total catch composition between 1997 and 2008. Total catch of this fish in 1979 was 285 mt (Karimpour and Azari, 1980). It exceeded to 3802 mt in 2006 (Ghaninejad and Abdolmalaki, 2009). Kilka fishes are commercially important and play a significant role in food chain. They are es-pecially a prey for the Caspian seal (Phoca cas-pia) and birds (Kazanchev, 1984). Annual mean catche of kilka between 1982 and 1991 was 4576 mt (Emadi, 1992). The catch of kilkas from dra-matically deceased after 2001. However, there has been an increase in the catch of kilka in 2008 (15411 mt). Main reason for the decreasing in kilka catch was attributed to the entry of unin-vited guest comb-jelly (Mnemiopsis leidyi) to the Caspian Sea (Ivanov et al., 2001). This organism is a food competitor to kilka fish and feeds on eggs and larva as well (Esmaeily Sari et al., 2001; Fazli and Roohi, 2002). Sayad Bourany et al. (2008) more recently reported that after the inva-sion of comb-jelly, the catch composition of kilka fish changed. For example, the catch of anchovy kilka declined from 80-85% (in 1998) to 50.5% (in 2003), while common kilka increased from 5.5% (in 1998) to 48.9% (in 2003). Sturgeon fish catch in the Caspian Sea were 23000 mt in 1910. It increased to 75000 mt in 1940 (Barannikova, 1987). In the first day of May in 1927, about 2000 female of sturgeon were fished from Sapidrud River and their caviar was 7335 kg. In 1961, only 1500 sturgeon (both sexes) was caught from this river and their caviar was 2520 kg (Melatparast, 1987). The annual catch of this fish in 1982 was 27000 mt and in 1991 it exceeded to 13558 mt (FAO, 1993). A sharp reduction in the catch after the break up of the USSR was occurred. The annual caviar pro-duction in the Southern Caspian Sea (Iranian sides) from 1971 to 1989 varied between 191.5- 304.5 mt (Taghavi, 2001). The sturgeon fishing and caviar production in 1979 was 1809 mt, the catch composition before 1982 were: Persian sturgeon 10%, Russian sturgeon 24%, stellate sturgeon 50%, great sturgeon 14% and spiny sturgeon 2% (Karimpour, 1983). In 1989, caviar production in Iran was 297.3 mt. The caviar pro-duction of stellate sturgeon was 199.9 mt (Ka-rimpour, 1990). Annual average of sturgeon be-tween 1982 and 1991 was 2060 mt and annual mean of caviar production in this period was 292 mt (Emadi, 1992). In 2008, the catch of sturgeons was 225 mt. The catch composition was: Persian sturgeon 68%, Russian sturgeon 5%, stellate sturgeon 11%, great sturgeon 9% and spiny stur-geon 7%. However, a sharp increase has been ob-served in the proportion of Persian sturgeon catch after artificial propagation and fingerling culture in Iran. Veladykov (1964) reported that in the stur-geon catch season in 1933, 42000 specimen of Persian sturgeon and 224 Russian sturgeons were caught, but in 1971-72 this proportion changed. 7420 Russian sturgeon and 349 Persian sturgeons were fished (Haghdar, 1989). In 2008, the total catch of sturgeon fishes 88% increased in com-parison to 1979. Restocking of commercial bony fish species in rivers which flow into Caspian Sea is the main reason for the increase in bony fish production. Moreover, uncontrolled activities for artificial propagations and sturgeon fingerling culture complex, annihilation of natural spawning grounds, over fishing in the north coast of the Caspian Sea and rivers, and oil pollutants after the break up of USSR in Russia, Kazakhstan and Azerbaijan are the main reasons for reductions in sturgeon catch. The invasion of comb-jelly and over fishing are the main reasons for decreasing kilka fishing in Iran. In 1976, total fish catch in the Southern Seas was 50000 mt (SIFC, 1977). In 1979, the total catch of the Persian Gulf and the Oman Sea was 24941 mt, Scombridae family with 346 mt were dominated and Sciaenidae family, silver pomfert (Pampus argenteus) and black pomfert (Pseu-dorhombus elevates) were the most abundance in catch composition (IFC, 1994b). In 1997, the to-tal catches rised to 255041 mt (10.2 times more). Scombridae family was dominated in the catch with 25%. Yellow fin tuna (Thunnus albacores),long tail tuna (Thunnus tanggol) and skip jack tuna (Katsuwonus pelamis) were comprised 32%, 29% and 13% of Tuna fish, respectively. In 2008, total catch of fish species was 322121 mt. In this year the catch composition was: tuna fish species 50% (skip jack tuna, long tail tuna and yellow fin tuna), sharks 4%, Sar-dinella 5%, Sciaenidae family 2%, large head hairtail 1%, sea cat fish 1% and Japanese thread fin bream 2%. Sharks, Sardinela and Japanese thread fin bream were increased 34%, 80% and 73% respectively, but the catch of Sciaenidae family, large head hairtail and sea cat fish were reduced 15%, 67% and 36% respectively in com-parison to 1997 (PGEI, 2010). Total catch in 2008 was 12.9 times more in comparison to 1979. The catch of tuna fish in 2008 was in-creased 197% in comparison to 1997 (skip jack tuna 1146%, long tail tuna 41% and yellow fin tuna 4%). Total catch of Spanish mackerel (Scomberomorsus commerson) in 2004 was 8000 mt, It was almost twice in 1997 (Taghavi, 2008). Among the Chinese carps, grass carp was in-troduced to Iran by USSR experts in 1968 and its artificial propagation was started (Goroohi, 1976). The artificial propagation of carps was carried out in research scales in small earthen ponds by IFRI. Fry production was released to Anzali Lagoon for controlling rapid growth of aquatic vegetation. In 1974, 131000 fry of grass carp were released to Anzali Lagoon (Hosseinza-deh, 1975). In 1971, Sapidrud husbandry com-plex started to do culture of Chinese carps with the technical cooperation of Rumanian experts. In the same year 0.4 million larva of this fish was transferred from Rumania. In 1972, the produc-tion of Chinese carps was 60 mt. In addition, cul-ture studies of these fish were carried out by Sapidrud Husbandry Complex. Total production of Chinese carps in 1979 was about 3000 mt (Radjabi, 1982). People attendance to consume fisheries pro-duction and government’s financial aid were the main reasons for Chinese carps production de-velopment. In 1997 and 2008, total production of Chinese carps in Iran was 10.7 and 37.4 times higher respectively in comparison to the produc-tion of 1979. There were not any shrimp culture farms in Iran before 1979. In 1990s the Government also paid attention to carry out this activity. After 1990, many shrimp culture farms were built in the southern provinces including Khozestan, Bandar Abas, Booshehr and Sistan-Bluchestan. In 1997, shrimp production was 163 mt. It reached to 8903 mt in 2005. The fluctuations of shrimp production in recent years were a result of virus infection in the shrimp farms (Tokhmafshan et al., 2004; Afsharnasab et al., 2007). Shrimp production in Iran is 2 mt per hectare. On the other hand, giant shrimp culture was started in 1987 in a research scale in Gilan prov-ince, but it was not successful. The climatic con-ditions of Gilan province were the main reason for the failure. In the Southern province giant shrimp culture was started in 2002 with 6 mt and it exceeded to 258 mt in 2008. The fisheries production in inland water-bod-ies in 1979 was about 3000 mt, but after 1997, its annual mean was 27465 mt. between 1932 and 1940, the annual fish catch from Anzali Lagoon was 5500 mt, in 1964 it reduced to 100 mt and in 1994 it was 550 mt. The main reasons of this re-duction were over fishing, pollution, delta for-mation, and rapid growth of aquatic vegetation (Hydrorybproject, 1965; Holcik and Olah, 1992; Karimpour, 1994). Artificial propagation of kutum in Iranian riv-ers of the Caspian Sea has been carried out for 60 years. Mature females and males of kutum mi-grate into rivers for spawning in the spring. In this period, they are fished for artificial breeding. In 1969, IFRI produced 71.35 million larvas and released them into rivers that brood stock they were fished (Hosseinzadeh, 1971). In 1974, a small center for larva culture and fry production under the authority of IFRI was built. In the same year 2.1 million of kutum fry was produced and in 1977 fry production exceeded to 13 million and 50 million of kutum larva. Between 1974 and 1977 fry and larva productions were 28.5 and 250 million respectively. The production was released to the rivers by IFRI (Emadi, 1978). However, after the Islamic revolution, artifi-cial propagation of kutum was stopped. In 1981 and 1982 kutum catch dramatically decreased. In these years, kutum catch were 97.6 and 100 mt respectively. In 1983 artificial breeding of kutum was started again. In 1997 and 2008, fry produc-tion was exceeded to 142 and 262 million re-spectively (Valipour and Khanipour, 2009). Building of four big complexes for eggs incuba-tion, larva and fry culture in the coastal Iranian provinces of Caspian Sea caused an increase in fry production and kutum catch. In the first years of 1970ss with cooperation of Russian experts a big complex was built for arti-ficial propagation, eggs incubation, and larva and fingerling culture of sturgeon fish. Operation of this complex was started in 1974 and its finger-ling production was 2.619 million of stellate sturgeon, Persian sturgeon and Russian sturgeon. In 1979, the fingerling production of sturgeon fish exceeded to 3.245 million (Ramin and Si-rang, 1992). Fingerling production in 1997 and 2008 were 7.57 and 3.87 times higher in com-parison to 1979. In recent years the condition of Sapidrud and other rivers is changed and brood stocks of stur-geon fish are prepared from the Caspian Sea. The main reasons of these difficulties are: dam con-structions, excavation and sand removal from rivers bed, usage of river’s water for agricultural propose in spawning season, erosion by cutting trees and shrubs in the mountains. Until 1986 Iran had one complex for artificial breeding and fingerling culture of sturgeon fish. It was ex-ceeded to four in the first years of 1990s. Conse-quently, an increase in artificial propagation of Persian sturgeon caused an increase in the catch of this fish. Chinese carp fry production was began in 1978. In that year Sapidrud Husbandry complex produced 7 million fry (Radjabi, 1982). Devel-opment of Chinese carp culture systems caused an increase in fry production. Composition of Chinese carp fry production are 70% for silver carp, 15% for big head carp, 10% for common carp and 5% for grass carp. The fry production in 1997 and 2008 were 18.6 and 20 times higher in comparison to 1978, respectively. Artificial propagation and smolt culture of Caspian salmon was began about 50 years ago. In 1950s, mature individuals of this fish were caught when they migrated to rivers in spawning season. In Toonkabon city there was a small sta-tion for artificial propagation and smolt culture of Caspian salmon and brood stocks were trans-ferred to this station under authority of IFRI. The number of smolt production was 15-20 thou-sands. In 1977, a complex for artificial propaga-tion and smolt culture was built with the cooper-ation of USSR experts. Its activities were begun in 1984 (Karimpour and Hosseinpour, 1985). To-tal smolt production between 1991 and 2007 was 7.38 million and its catch was 68.6 mt (Gha-ninejad and Abdolmalaki. 2009). However, the artificial propagation and smolt production of Caspian salmon did not cause an increase of Cas-pian salmon catch. Environmental degradation and alteration, including siltation, damming of stream, and extraction of water for irrigation were the main reasons of decline in salmon catch in the Caspian Sea (Holcik and Olah, 1992). Rainbow trout culture farms imported eyed eggs from Denmark till 1979. IFRI produced fry of rainbow trout in small scales. Hosseinzadeh (1975) reported that in 1974 IFRI produced 40000 fry of rainbow trout. The fry production of this fish in Iran was started to develop in 1984. Today private farms produce rainbow trout fry for culture farms. In recent years, some rainbow trout farms import fry from France. The reason for this is that imported fry of rainbow trout have higher growth rate than those of produced in Iran. IFRO started to carry out the artificial breed-ing and fry culture of pikeperch, bream and roach in 1988 (Haghpanah, 1989; Sharifi and Ramin, 1990). Later, the propagation and fry culture of these bony fishes were also carried out by IFO in large scale. Produced fry were released into riv-ers for restocking purposes of these fish species in the Caspian Sea. After these stockings, in 1990, 50 mt of these fish species were caught in the Caspian Sea. In 2008, the catch increased to about 200 mt (Ghaninejad and Abdolmalaki, 2009). Iran population and total fisheries production in 1979 were 30 million and 39515 mt respec-tively. Therefore, the annual consuming of fish production per person in 1979 was 1.3 kg. In 1997 and 2008, it was 3.4 and 5.6 times higher than that of 1979, meanwhile the world average is around 16 kg and the EU average is around 22 kg per person (Yılmaz et al., 2008). Figure 2 shows the fish consumption of per person per year in Iran between 1997 and 2008. The number of fishermen in the Caspian Sea in 1979 was 4500 including bony fish, sturgeon and kilka fishermen (Emadi, 1992). The Iranian Fisheries Company in the coastal provinces of the Caspian Sea employed about 1000 people for caviar production, fish smoking and salting, packaging, refrigerators workers and official em-ployers. In 1982, the number of fishermen in the Caspian Sea was 16220 and employers in IFC were 1506 (YCE, 1984b). The number of fisher-men in the Southern Seas was 21622 and the number of employers in SIFC was 1763 in the Persian Gulf and the Oman Sea. 40 fishermen cooperative were in progress active in the Cas-pian Sea for bony fish species fishing (Karimpour and Azari, 1980). Till 1984, the meat of caviar and sturgeon was exported to foreign countries (USA, USSR and Europe). The export amount was 185-200 mt caviar and 1200-1300 mt stur-geon meat. The value of exported products was about 30 million $ (Karimpour, 1983). In 1976, shrimp export was about 3000 mt with 10 million $ value (SIFC, 1977). In 1979, it reduced to 400 mt and the value was 1.5 million $ (YCE, 1984a). 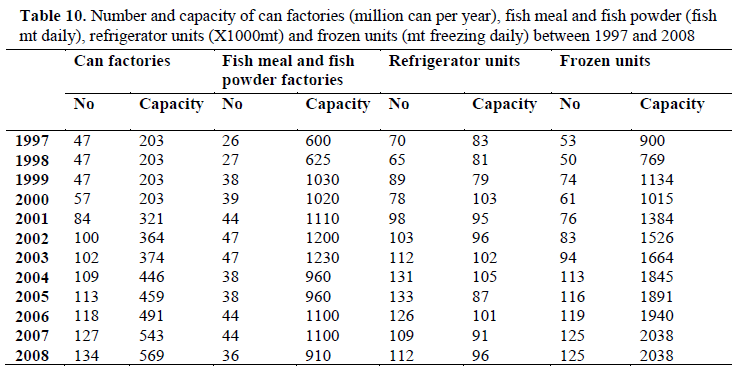 In 1973, SIFC had only 7 refrigerators with 2550 mt capacity and 5 frozen units with 46 mt freez-ing per day in Iranian coastal provinces of the Caspian Sea. YCE (1984b) reported that in 1982 in the coastal provinces of the Caspian Sea had 6 refrigerator units with 2510 mt capacity and 8 frozen units with daily capacity of 66 mt. In 1976, SIFC had 6 refrigerators with 2200 mt ca-pacity and 2 frozen units with capacity of 2.5 mt per day (SIFC, 1977). • Rapid growth of Iran population after 1979 and fast increase rate of unemployment in Iran. • People attention for consuming sea foods and exploitation of some aquatic animals, for example crayfish, lobster, crabs and squid are not consumed in the country. They are mainly exported. • Government investment in fisheries, aqua-culture and fisheries industries. • Developing of fisheries research in Iran. • Establishing artificial propagation, fry and fingerling culture complex. • Increase in Chinese carps, rainbow trout and shrimp culture. • Increase in the number of fisheries research centers and fisheries faculties. • Attracting foreign currency by fisheries pro-duction. • Developing of fishing in the Southern Seas to Indian Ocean and providing modern fish-ing ships. • Increase in the number of can factories, es-pecially for tuna fishes. • Using lands for aquaculture that can not be used for agriculture. • Using of rivers and streams in cold climate regions for rainbow trout culture. • Improvement of refrigerators and frozen units for fish products. • Improvement of rural roads and possibilities, popular requires for occupation and em-ployment, increase of farm products espe-cially red meat, more attention to human health and hygiene in recent years are the other main reasons for increasing fisheries production in Iran. We would like specially tanks Mr. Gha-ninejad, Mr. Djalili, Mr. Danesh, Mr. Tooloi, Mr. Hosseinjani and Mr.Mazdak Karimpour who helped us for preparing this article. Afsharnasab, M., Dashtyannasab, A., Yeganeh, V., Soltani, M., (2007). White Spot disease (WSD) in Penaeusindicusfarms in Bushehr province, Iranian Journal of Fisheries Sci-ences, 7(1): 15-26. Barannikova, I.A., (1987). Review of Sturgeon farming in the USSR. Vopr. Ichthyol.,5: 735-46. Belyaeva, N.A., Velasenko, V.V., Ivanov, P., (1989). Fish fauna and commercial re-sources of the Caspian Sea. USSR Academy of Sciences, Russia, pp: 236. Emadi, H., (1992). Northern Iranian fisheries, committee for development and manage-ment of fisheries resources. Iranian Fisheries Company, Tehran, pp: 9. Emadi, H., (1978). KutumRutilusfrissikutumpast and present situation in Iranian coastal waters of the Caspian Sea. Iranian Fisheries Research Institute, Bandar Anzali, pp: 25. Esmaeily, Sari A., Abtahi, B., Saifabadi, J., Khodabandeh, S., Talaei, R., Sarvish, F., Er-shad, H., (2001). Invasive Mnemiopsisleidyiand Caspian Sea future. NashreMehrPubli-cation, Iran, pp: 2-7. FAO, (1993). Fish State Catches and Landing. Food and Agriculture Organization, Rome, pp: 76-156. Fazli, H. Roohi, A., (2002). The impacts of Mnemiopsisleidyion Kilka resources in southern Caspian Sea. Iranian Fisheries Or-ganization Press, Iran, pp: 63-72. Ghaninejad, D., Moghim, M., Abdolmalaki, S., (2001). Caspian Sea bony fishes stock as-sessment. Gilan Fisheries Research Center, Pp: 98. Bandar Anzali. Ghaninejad, D., Abdolmalaki, S,. (2009). Sus-tainable exploitation of bony fishes in Irani-an coastal waters of the Caspian Sea: Neces-sities and requirements, Iranian Scientific Fisheries Journal, 18(2): 105-118. Gouroohi, N., (1976). Artificial propagation and fry culture of Grass Carp (Ctenopharingo-don iddela) for introducing to Anzali La-goon, Iranian Fisheries Research Institute, Bandar Anzali, pp: 32. Haghdar, S.M., (1989). 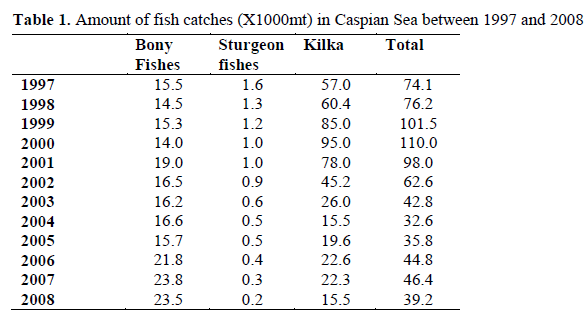 The rate of Caviar to Sturgeon weight in Iranian coastal waters of the Caspian Sea. Iranian Fisheries Research Organization, Bandar Anzali, pp: 26. Haghpanah, V., (1989). Artificial propagation of Pikeperch Sander lucioperca. Iranian Fisher-ies Research Institute, Bandar Anzali, Ban-darAnzali, pp: 18. Holcik, J., Olah, J., (1992). Fish, fisheries and water quality in Anzali Lagoon and its wa-tershed. Field Ducument 2. FAO, Rome, pp: 109. Hosseinzadeh, H., (1971). Report of Kutumarti-ficial breeding in Iranian Rivers in the Cas-pian Sea. Iranian Fisheries Research Insti-tute, Bandar Anzali, pp: 34. Hosseinzadeh, H., (1975). Iranian Fisheries Re-search Institute activities in 1974. Iranian Fisheries Research Institute, Bandar Anzali, Pp: 23. Hydrorybproject, (1965). Fish and cultural rec-lamation of the Anzali Lagoon. State Indus-trial Fisheries Committee, USSR, State De-sign Institute on Hydro technical, Fish Cul-ture Reclamation and Land Construction, Moscow, pp: 60. IFC (Iranian Fisheries Company), (1994a). The socio- economic program for development fisheries in Caspian Sea, fisheries history of Caspian Sea in 1989-1993. Iranian Fisheries Company, Planning and Developing Office, Iran, pp: 142. IFC (Iranian Fisheries Company), (1994b). The socio-economic program for development fisheries in southern seas of Iran in 1989-1993. Iranian Fisheries Company, Planning and Developing Office, Iran, pp: 188. IFRI (Iranian Fisheries Research Institute), (1979). Report of Rainbow Trout culture in Iran. Iranian Fisheries Research Institute, Iran, pp: 7. Ivanov, P., Shigonova, T.A., Muaeva, E.I., Zy-kov, L.A., Sokolski, A.F., (2001). In the Caspian Sea, Ctenophora, Mnemiopsisleidyiand its preliminary results of study of its ef-fects on pelagic ecosystem. First Interna-tional Meeting “the invation of the Caspian Sea Comb-Jelly Mnemiopsisleidyi. Prob-lems, perspective, need for action”. Baku, Azerbaijan, Apr 2001. Karimpour, M., Azari, P., (1980). The social studies of fishermen cooperatives in Gilan province. Gilan Fisheries Management, Bandar Anzali, pp: 96. Karimpour, M., (1983). Statistical study of stur-geon fishes catches and Caviar production in Iranian shore of the Caspian Sea in 30 years. Gilan Fisheries Management, Bandar Anzali, pp: 118. Karimpour, M., Hosseinpour, S.N., (1985). Bio-logical survey of Caspian salmon (Salmotrutacaspius). Gilan Fisheries Research Center, Bandar Anzali, pp: 148. Karimpour, M., (1990). Sturgeon fishes, catch season, Caviar production and planning fortheir catches. Gilan Fisheries Research Cen-ter, Bandar Anzali, pp: 33. Karimpour, M., (1994). The fish fauna and esti-mation of fish yield from Anzali Lagoon. Caspian Sea Bony fishes Research Center, Bandar Anzali, Iran, pp: 92. Kazanchev, E.N., (1984). Caspian Sea fishes. Vol. 1. Translated to Persian: Adeli Y. 1994. Gilan fisheries Research center, Bandar Anzali, Iran, pp: 93. Melatparast, A., (1987). Ecological studies of Sapidrud River and the role of pollutants in this river on migration of Sturgeon fishes. Iranian Fisheries Company, Iran, pp: 97. PGEI (Persian Gulf Ecology Institute), (2010). Statistics of catch composition in 1996-2008 of Southern Seas. Sent to Djalili in National Fish Processing Center, Iran, pp: 20. Radjabi, A., (1982). Artificial breeding and cul-ture of Chinese carps in Iran, history and technique. Sapidrud Husbandry Complex, Iran, pp: 92. Ramin, M., Sirang, H., (1992). The studies of Sturgeon fishes migration To Sapidrud River and their migration difficulties. Gilan Fish-eries Research Center, Bandar Anzali, pp: 69. Sayad B.M., Abdolmalaki, S., Khanipour, A.A., Fazli H., Khedmati, K., (2008). Catch com-position and fishing trend of Kilka in Iranian part of the Caspian Sea, Iranian Journal of Fisheries Sciences, 7(2): 73-86. Sharifi, A.A., Ramin, M., (1990). Artificial breeding and fry culture of Bream (Abramisbrama) and Roach (Rutilusrutilus). Iranian Fisheries Research Organization, Bandar Anzali, pp: 84. SIFC (Southern Iranian Fisheries Company), (1977). History of the foundation and account of fishing activities in Persian Gulf and Oman Sea. Special bulletin for national celebration of 2500th anniversary of founda-tion Iranian Empire by Cyrus the Great. Southern Iranian Fisheries Company, Teh-ran, pp: 70. Taghavi, M.A., (2001). An estimation of growth parameters, mortality rates and yield per re-cruit for Great Sturgeon (Husohuso) living in Caspian Sea, Iranian Journal of Fisheries Sciences, 3(2): 25-48. Taghavi, M.A., Seyfabadi, S.J., GhodratiShojaei M. Abtahi, B., TaheriMirghaed A., (2008). Population dynamics of Spanish mackerel (Scombeoruscommerson), Iranian Journal of Fisheries Sciences, 7(1): 15-26. Tokhmafshan, M., Sharif, M., Hassan, D., Wang, Y.G., (2004). Identification of PenaeusmonodonBaculovirus (MBV) in culture Pe-naeussemiscatusin Iran, Iranian Journal of Fisheries Sciences, 4(1): 25-44. Valipour, A.R., Khanipour, A.A., (2009). Kutum, jewel of the Caspian Sea. Iranian Fisheries Research Organization, Tehran, pp: 84. Veladykov, V.D., (1964). Inland fisheries re-sources of Iran especially of the Caspian Sea with especial reference to Sturgeon. Report to the Government of Iran. Food and Agri-culture OrganizationReport, 1818, 51 P.
YCE (Yekom Consulting Engineers), (1984). Southern Iranian Fisheries Company, past and present. Ministry of Agriculture, Teh-ran, pp: 118. YCE (Yekom Consulting Engineers), (1984). Iranian fisheries in Caspian Sea, past and present. Ministry of Agriculture, Tehran, pp: 58. Yilmaz, S, Akay, A.S., Gümüs, E., 2008. Fisher-ies sector in Turkish economy and market-ing of fishery products, Journal of Akdeniz University Agriculture Faculty, 21(2): 265-272.